Four, three, two, one. Those numbers speak to the career of one, Brandon Pirri, the journeyman winger who is currently a member of the Vegas Golden Knights. His path to the Golden Knights has been an interesting one, to say the least. At just 27 years old, Pirri has already been a part of five different organizations, playing meaningful NHL games for each team. Now with the Golden Knights, Pirri is experiencing an unfortunately familiar fate, stuck as the odd-man out, the dreaded healthy scratch. Much debate has taken place, regarding the usage and effectiveness of Pirri. Should he really be the odd-man out, on a nightly basis, considering the Golden Knights are at a less-than-full playing strength? Four. Pirri spent four seasons with the Chicago Blackhawks. 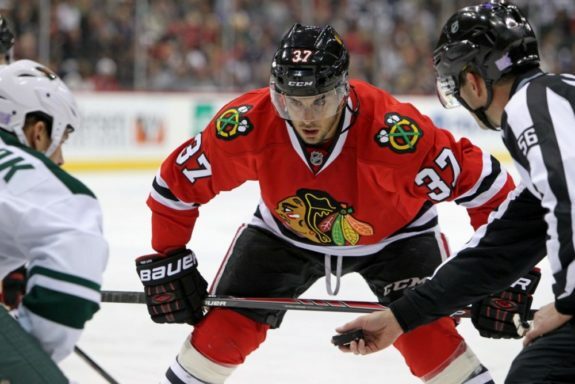 Although he only appeared in a mere 35 games with the Hawks, the four years Pirri spent between the Rockford IceHogs (AHL) and Chicago represent his longest tenure with one club. The Blackhawks drafted Pirri in the second round (59th overall) of the 2009 NHL Entry Draft, a draft littered with top-level talent. John Tavares, Victor Hedman, Matt Duchene, Evander Kane and Brayden Schenn went off the board as the first five picks and all play important roles in the NHL, for teams in the playoff race. Pirri’s appeal to the Blackhawks came in his offense and his ability to play the center position. During that time, Chicago was a powerhouse in the NHL, backed by budding superstars Jonathan Toews, Patrick Kane and Duncan Keith. In 2010, the Hawks won the Stanley Cup, their first in a run of three championships between 2010 and 2015. Unable to consistently crack the big club’s lineup, Pirri spent most of his time in the AHL, with the IceHogs. Pirri recorded double-digit goal totals each season with Rockford, highlighting his offensive potential. Despite his offensive upside, Pirri never stuck with the Blackhawks. In 2012-13, Pirri took home the AHL scoring title, with 75 points in 76 games played. His exceptional season earned him a spot with the big club out of camp, but he was eventually sent back to Rockford, after 23 games with the Blackhawks. 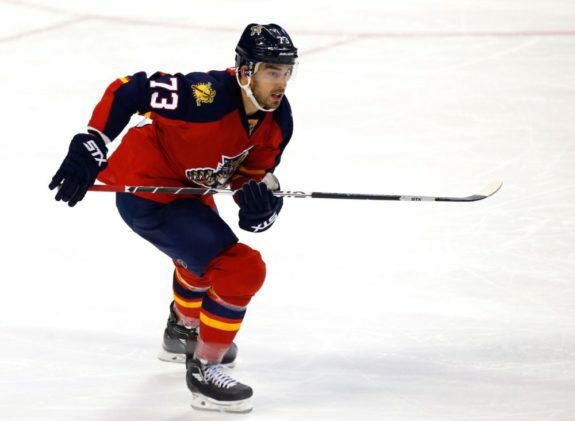 Fast-forward to March, and Pirri was shipped to the Florida Panthers in a deal initiated by former Blackhawks general manager Dale Tallon. Tallon, who drafted Pirri, knew all about his skillset. Tallon was able to acquire his guy, for the low price of a sixth-round draft pick, just one season removed from leading the AHL in scoring. 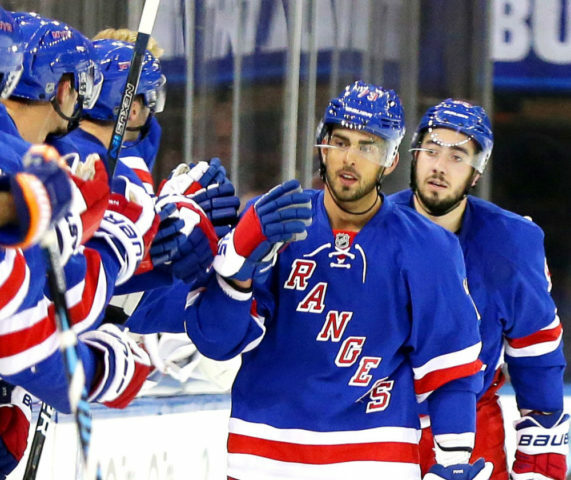 Pirri was finally going to get his chance to make an impact in the NHL. Three. Pirri lasted three seasons in Florida. His acquisition immediately paid off for the Panthers as he went on to score 22 goals over 49 games, in his first full season with the club. At the trade deadline the next season, the Panthers flipped Pirri to the Anaheim Ducks, for, you guessed it, a sixth-round draft pick. A consistent knock on Pirri’s game was his defensive shortcomings. Not all players turn out to be elite 200-foot guys, in the mold of a Paul Stastny, Mark Stone, Sean Couturier, Anze Kopitar and the Selke-stalwart, Patrice Bergeron. Pirri has never been seen as the best defensive player, but you take the good with the not-so-good. He clearly showed an ability to put pucks in the net. Anaheim agreed and paid the meager price for a guy with 20-goal potential. One. Pirri only spent that one season with the Ducks. Following the trade, he appeared in nine games, recording three goals and two assists. Ending the season as a restricted free agent, Pirri was not extended a qualifying offer by the Ducks. Anaheim’s own SB Nation site, Anaheim Calling, reported their displeasure in that decision, noting Pirri’s offensive output through intermittent NHL time. Goals and points help you win games. Scoring should certainly mean more to teams than it has in Pirri’s tumultuous journey toward becoming a NHL regular. His statistics speak for themselves, he sports decent scoring averages, yet can’t hold down an NHL spot. Is he that bad defensively, that his offensive upside is completely disregarded? Diving deeper into the metrics, Pirri put up solid play-driving numbers with the Blackhawks and Panthers. Over his 35 games in Chicago, Pirri recorded an even-strength Corsi For of 51.5 percent. In the 122 games with Florida, he posted a Corsi For of 50.2 percent, positive shot generation while he was on the ice. When Pirri was on the ice, his team generated more shots than the opposition, a stat that simply can’t be, if he were the defensive liability teams chose to peg him as. One. Once he was not qualified by the Ducks, Pirri signed on with the New York Rangers for one season, at a $1.1 million cap hit. He ended up playing 60 games as a Ranger, struggling his way to a line of eight goals and 10 assists, a down season for the forward. Following his sole season in New York, Pirri signed a two-way deal with Vegas, in an effort to be closer to his expectant wife in Chicago, where the Golden Knights’ AHL affiliate is located. Signing on with the expansion team, Pirri put himself in a position to eventually make it back to the NHL. Getting Lucky With the Vegas Golden Knights? Two. 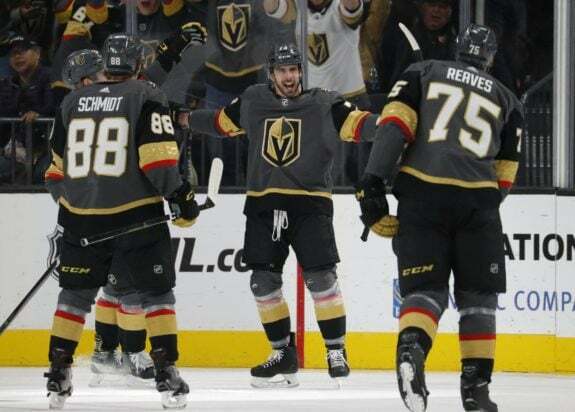 It has been two seasons with the Golden Knights organization for Pirri. His first season with the Chicago Wolves went extremely well, as he compiled 29 goals and 23 assists for 52 points in 57 games. He received a call to the NHL at the end of the season, and subsequently scored three goals in two games with the Golden Knights. Their surprise run to the Stanley Cup Final, combined with the offseason additions of Max Pacioretty and Stastny, left Pirri to begin the season in the AHL. Pirri wasn’t even the Knights’ first call-up this season, as they used the likes of Tomas Hyka and Daniel Carr prior to Pirri getting another shot with the team. Currently, Pirri is sitting games out in favor penalty-killing wingers Tomas Nosek and Ryan Carpenter. Combined, Nosek and Carpenter only have 31 goals in 267 games played. To say the offensive upside is limited with those two is a drastic understatement. Pirri’s lines are pushing play at an impressive rate, evidenced by his 57.0 percent Corsi For and 4.1 percent Corsi-rel (relative to teammates) this season. Both of those numbers place Pirri in the top-five on the team, among players with a minimum of 20 games played. His numbers suggest that he figured out how to stick at the NHL level, yet his usage does little to support that notion. Utilizing Pirri on the third line, alongside Cody Eakin and Alex Tuch gives Vegas three legitimate scoring lines. Instead, head coach Gerard Gallant has shown a propensity to utilize grinders such as Carpenter, Nosek and the notorious Ryan Reaves. Once Will Carrier returns from injury, it seems unlikely that Pirri plays another game with the Golden Knights. Despite his value as an offensive contributor, Pirri looks to be out of the mix, a placeholder for the remainder of 2019, barring injury. Should Pirri be on the outside looking in? Quite simply, the answer should be no. Come playoff time, the Golden Knights will need to score, and not just on the top two lines. Pirri gives them the best look on line three and simply sitting him for penalty-killing grinders is a head-scratcher. Top-liners William Karlsson, Reilly Smith and Stastny are good penalty killers, lessening the Golden Knights’ need to play “bottom-six” types of players. Making the decision to sit a proven goal-scorer heading into the playoffs is baffling. With the addition of Stone, Vegas has been reinvigorated to the tune of a 9-1-0 record since the trade deadline. At some point, that shine could wear, and their willingness to use a sub-optimal lineup could come back to bite them. Pirri will likely receive many contract offers in the offseason, and with his current lack of usage, expect to see Pirri playing in the NHL with the sixth team of his career next season.